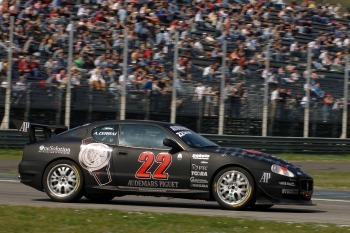 Italian Alberto Cerrai, current champion of the Trofeo Maserati, won the first race of the 2006 Trofeo Audemars Piguet Maserati Europa on Sunday. British driver Moz Fabris and Italian Manuel Villa took second and third place respectively. The final laps of the race witnessed a tight battle for second spot between Manuel Villa and Andrea De Megni (in the Pakelo VIP car). De Megni nudged Villa into a spin from which he recovered to come back onto the track in fourth. At the chequered flag, the race order was Cerrai, De Megni, Fabris and Villa but a 20 second penalty for De Megni relegated him to fourth place. It was the first podium in the Trofeo Maserati for former rally driver Villa. Starting from P2, just behind pole-sitter Diego Alessi, Cerrai held second place until lap 14 when he eased into the lead and increased his advantage lap after lap. The safety car was called onto the track in lap four, after Brazilian Beto Richa went off at the Ascari curve. The group compacted once more, with Alessi in the lead. During the following lap, Nicolò Oddi overshot turn one and ran into Moz Fabris’s car first then into Alberto Radaelli's. Oddi, who races with Matteo Cambi, owner of Italian fashion label Guru, was forced to retire while Fabris continued to finish the race and Radaelli managed to keep going until the 17th turn, before his damaged car finally gave in. Luigi Moccia and Stefania Grassetto finished a great seventh in the Toora VIP car. They were beaten by Alberto Pizzicannella (fifth) and Alberto Vescovi (sixth). The third VIP car, bearing Audemars Piguet colours, finished 15th with former WRC driver Jean Claude Andruet and Philippe Liechti on board. The other UK driver, Phil Burgan, at his debut in the Maserati Trofeo series, finished a respectable 11th. The next round of the Trofeo Audemars Piguet Maserati Europa will take place at Silverstone (UK) on 7th May 2006. The event will support the FIA GT International Championship. The Maserati Trofeo GranSport is the racing version of the Maserati GranSport. Built at the Maserati factory in Modena on the same production line as the GranSport, the Trofeo was designed to offer the driver an easy-to-drive car capable of stirring the emotions on the race track. 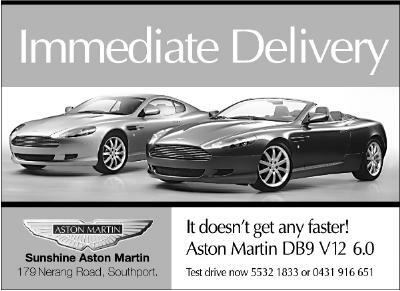 The 4200cc V8 engine produces 415 bhp and coupled to the six-speed gearbox from the standard road car it allows the driver to make the most of the power without compromising the torque. The ride height has also been reduced by 50mm. All non-essential accessories have been removed substantially reducing the weight of the Trofeo and improving the handling of the car.